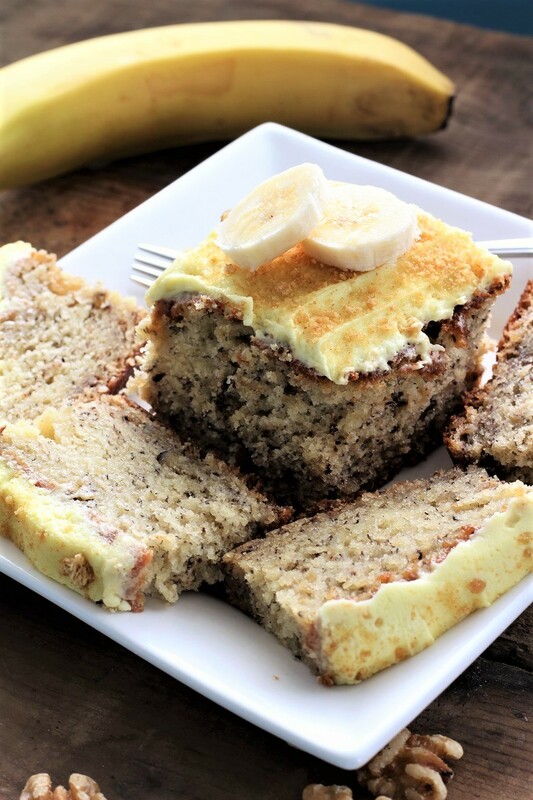 Banana cream cake is just like it’s name, rich, moist and smooth. Yes, and it is a little addicting! This makes a nice thick and heavy cake, but when you eat it, it all but melts in your mouth. The graham cracker is nice on top and helps cut a little bit of the sweetness. My oldest sister gave me this banana cream cake recipe and it is truly a good one. i know that I did a banana recipe not too long ago, but I just had too many bananas and I couldn’t let them go to waste. I also wanted to tell you that I baked this cake in my favorite cake pan. It looks kinda bad, but I have had this pan for almost 30 years. I must have gotten it when I was born. Haha. This pan and I have seen the days. I remember taking a cheese cake in it to my mom’s house and when we got ready to leave, there was some left. We set the pan on top of the car and put our bags in the back of our good old Doge Omni; it had a luggage rack on top and so I guess we just forgot about it. We were driving down the road, and you guessed it, something was flying off the back of the car. We stopped, backed up and retrieved our pan. Not the cheese cake though. I can make more cheese cake! I have tried to replace this pan many a time and ended up giving the new pan away. I guess the lesson is: some things look old and worn, but they are still amazing! I guess that I better get a will for this pan. Now go make a banana cream cake and enjoy! I feel very blessed, I cannot eat banana’s raw, but I can eat them cooked! I really like this cake, it is super moist and the frosting is the best. It is perfect for those birthdays that you need a last minute cake. It works up very fast. I know that yours will look a little better than mine and maybe soon, I can find a new pan that I LOVE! It is going to be hard because like I already said, me and this pan have been around the block and back again. This pan is like an old dog, they are so hard to replace and you just can not let them go! We have an old dog and and an old pan. Our dog is 14 years old, and I feel bad for her. She is getting so that she can not hear, or see and it is getting really hard for her to get around. But we just keep letting her hang in there. Some days you wonder if she is going to make it and the next day she is running around like there is nothing wrong. Oh, ya she has some arthritis in her legs and it is hard for her to go up and down the stairs. Do you ever freeze your bananas and then add them to your banana bread or cake. I know that people do it all the time and they say that it works very well. I have never tried it, but I will have to do it next time I make banana cream cake. Have you ever gone out to eat and you look at a dessert and think, I will have a piece of that cake and then you eat it and think to yourself, that is not worth the calories. So then I do not eat it because when you get a little older, you really have to watch yourself. This banana cream cake is one of those that you tell yourself, I think I will just have one more tiny slice and then another and another. Then you have to put the cake in a smaller container so that no one know that you have been sneaking in it. Yes, that really works, how will they know how much cake was in the pan if you put it in a smaller container, then it makes it look like a lot of cake because little container, lots of cake. Now isn’t that genius? This is one of my very first recipes that I posted and so it is time to retake a picture. I must say that I have come a long way in the last year or so, I went from not knowing how to take pictures to doing a little better now. I did luck out when I first started and get a couple of okay pictures. 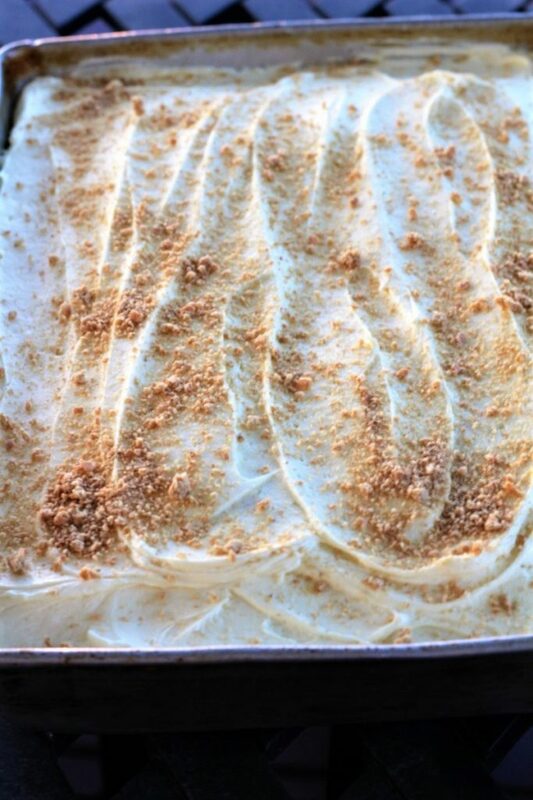 Enjoy the banana cream cake recipe. 1- They say that the ugly bananas make moist cake. 2- I put my bananas in my Bosch and brake them into small pieces. I never mash them, but you can if you want to. 3- I crush up my graham crackers in a bowl with the bottom of a glass. In a large mixing bowl, cream butter, and shortening; gradually add sugar and beat until light and fluffy. Beat in eggs, one at a time, then add vanilla. Then add flour, baking powder, salt, and baking soda, alternating with the whipping cream and sour cream. Add the mashed bananas and nuts; fold in until well blended. Bake in a 9" X 13" cake pan at 375 degrees for 40-45 minutes or until cake tester comes out clean. Cool. (This makes a nice moist, but very thick, heavy cake). In a mixing bowl, cream together powdered sugar and butter or shortening. Add vanilla and yellow food coloring (if desired). Add milk a little at a time, (add the amount you want for the desired fluffiness). Spread on a cooled cake. Take the graham cracker square and crush in a bowl until fine. (I use the bottom of a plastic glass). Sprinkle on top of frosting. (This will tone down the sweetness).